How do you carry your one piece tool? For a long time, I always kept my flat GasBaby (my one piece tool of choice at the time) on my keys as it seemed like the place it was meant to go. This worked out OK, but as I have 3 different sets of keys and because each bunch has so many keys and other crap on them, I often found myself without it when I needed or trying to use it awkwardly. So after a while I took it off my keys, stuck a lanyard on it and bunged it in my pocket. Now my one piece tool of choice is a regular GasBaby twinned with a FunnyBone. Both have lanyards tied on them and the GasBaby rides with me in my pocket and the FunnyBone sits in my urban wallet. I'm glad I changed my type of carry as my GasBaby gets used multiple times a day in all sorts of odd ways. I am hoping to do a test soon and recording just how many different uses I have found for it in a month. Like GadgetGuy and his pal Chigger (who I believe may have got the shove now actually ) this GasBaby rides with me everywhere and has become a great tool "pal" to me. So, how do you guys carry yours? Keys? Lanyard in pocket? Neck? Please share your methods and how they work for you. Re: How do you carry your one piece tool? 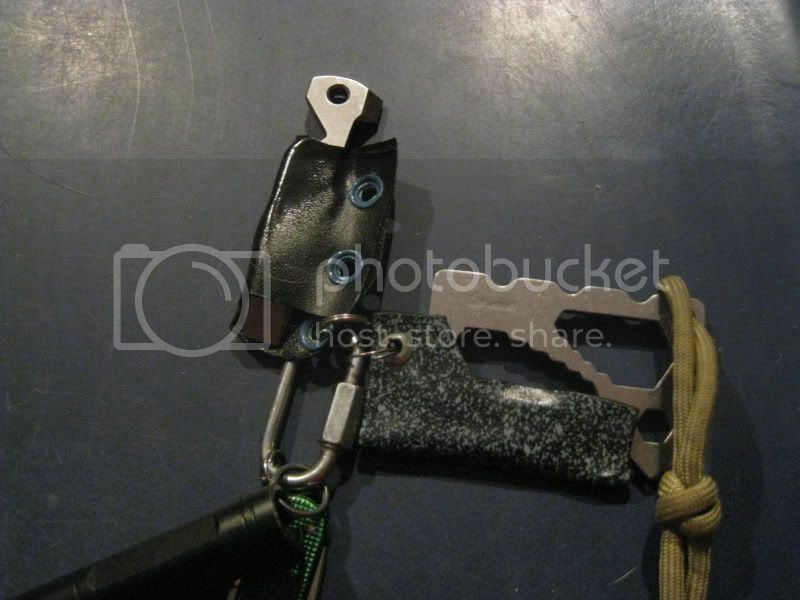 I prefer to make small Kydex sheaths for them and then carry them on a screwgate oval carabiner. I can clip it to keyrings or carry it separately by itself. The screwgate makes it secure but easy to swap tools when necessary. Using sheaths, I can pull the tool out and use it free of dangly stuff. And with the tools pulled out. I usually carry pocket tools on my keychain, but I also use a dedicated gadget keychain. The problem I have is the same one that Ben has. I never seem to have the right tool when I need it. I might try Ben's lanyard idea. I am a pocket man, got my P38.5 (was my G3 Prybaby) in my right pocket w/ some sort of tool clipped to the pocket itself. In my right pocket I have the Funnybone in with a pocket handkerchief a Arc Light. I do have a JDR Mini Beta on my Keyring for times like on my day off and I need something to pry with. 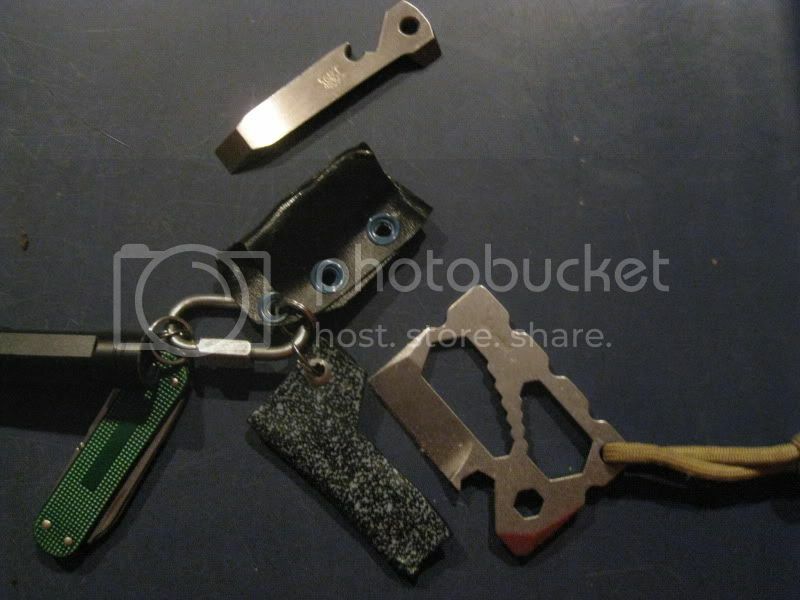 I tend to keep the EDC tools on the housekeys and then have all the other sets of keys as additions that clip on. I'll let you know when I have one. Well, besides the keychain one the Gadgeteer sent me. Hey Frog, pm me your address again, I have a fish for you. You'll have to trust me on this one. My complaint about split rings holding tools on ring is the time it takes to get the tool deployed. When it takes me 1/2 minute to get the tool out, I'd rather just use a SAK or MT. With the sheath, I pull out the tools on a ring, and pull the tool out of the sheath. Fractions of a second. Makes a convenient tool, convenient to use. I feel the same and that's why I went to pocket carry. Even a lobster type clip proved to be too much aggro for me. I like to be able to just grab it and go. When I used to carry my home made prybar I keep it on my keys. Can't justify the cost of pretty much all the cool toys in thread thou. I keep mine tethered to my knife. That way when I go very light, at least I have a knife and the Atwood. I like the theory of the knife tethering, but having them connected like that would bug the hell out of me. You and me both! It wouldn't last 5 seconds like that for me. Hrmmm... I'll have to try that, with a bit more length though. Might work out. As it happens, I am pretty happy with my lanyard method. Having it attached to a knife like that just seems like it would make both the tool and the knife difficult to use and you would have them rattling and knocking next to each other all the time.